Foundation was worried that UMT would break the sequence of education," explains Irwin. "To entice returning soldiers to attend college when their service ended, they offered scholarships to top high school students. The thought was if students had at least two years of college under their belt, they would want to return to school once their service ended." 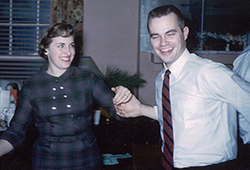 In 1952, Lafayette enrolled 16 Ford Scholars. In Irwin's case, his mother saw this as an opportunity to gain a head start on college especially if medical school was the ultimate goal. The scholarship covered his first two years at Lafayette, one of several colleges and universities participating in the program at the time. But for Irwin, starting college at 15 was difficult. "Some of the young students became nerds and others tried to assimilate, with difficulty, like regular college students," explains Irwin. "I attended Lafayette as a chemistry major but hadn't had high school chemistry and physics yet, so I had a very rocky start to my college education." In high school, Irwin wanted to become a physician like his father who had passed away when he was three. "I struggled academically at Lafayette and realized that I wasn't prepared to be a doctor, so I stayed with chemistry instead. Academics remained difficult and I dropped out of school several times and worked during these breaks. I ultimately graduated after seven years in 1959." 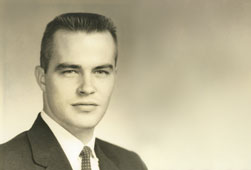 Irwin went on to subsequently earn a Ph.D. in pharmacy from Temple University. Irwin first worked in the pharmaceutical industry with Smith Kline & French (now part of Smith Kline Glaxo), before transitioning to Wyeth Laboratories in Radnor, PA where he spent 27 years until his retirement in 1995. "After 13 promotions from my start as a glassware washer at Smith Kline & French in 1957, I ended my career as a senior vice president of quality assurance/quality control, leaving the company prior to it being bought by Pfizer in early 2000." Irwin's favorite Lafayette moment was meeting his wife, Joan, on a blind date arranged by one of his Delta Upsilon fraternity brothers. Joan was attending Centenary College at the time. "Where else could you get a date before Lafayette went co-ed?" asks Irwin. We met during my senior year and were married that same year in 1959." 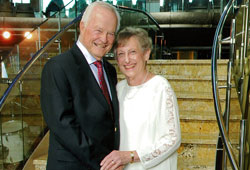 Two children and five grandchildren later, George and Joan are still married after 58 years. Irwin first began to give back to the College in 1996 when he established a charitable remainder annuity trust, with the chemistry department as a major recipient. As a result of this gift, Irwin was appointed to the James Madison Porter Society. Over the years, Irwin has added to this trust, further enhancing his philanthropy to the College. Three years ago, Irwin chose to continue supporting Lafayette with a charitable gift annuity after helping both of his children and grandchildren complete their education. "Joan and I decided we have taken enough major trips, and we were looking for income rather than growth with our investments. A gift annuity was the perfect answer. We received a 40 percent charitable deduction when the annuity was created and the return of 6.5% at our age is very attractive. In addition, a large percentage of the income for the first 19 years (I will be 98 when this time is up) is not taxed!" Irwin is grateful to Lafayette for all that the College did for him as a student. "I have had the opportunity to give back to Lafayette with thanks for what they gave a young 15 year old, many years ago."